Rutgers Climate Institute presents a talk by Timothy D. Searchinger as part of the School of Environmental Sciences Executive Dean’s Distinguished Lecture series. 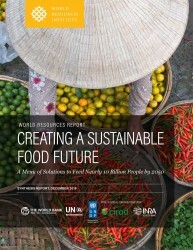 Searchinger is the lead author of a series of reports, including a new synthesis, by the World Resources Institute, the World Bank, and UN agencies on how to meet global food needs in 2050 while reducing greenhouse gas emissions titled Creating a Sustainable Food Future. Visit the Rutgers Climate Institute website to learn more and register for this event.